Choose a focus area in either Painting, Photography or Printmaking; it’s even possible to choose two focus tracks. Take courses in drawing and design to sharpen your seeing and analysis skills. In Painting, explore both abstract and representational art processes. In Photography, explore both digital and traditional processes. In Printmaking, be exposed to a range of processes including mono-printing, etching, lithography and woodcut. 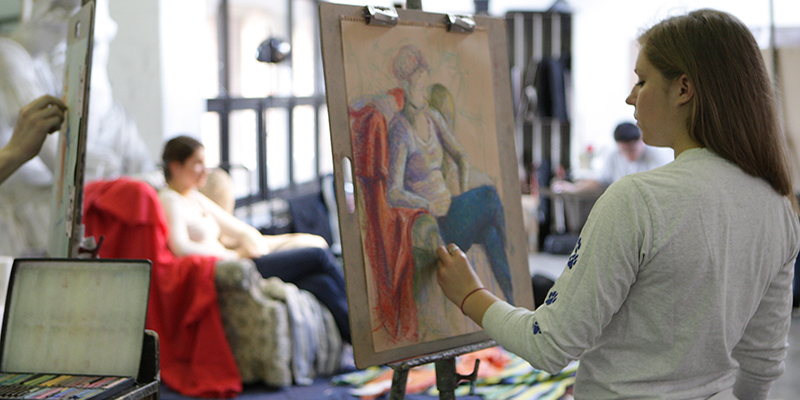 Be a part of a community of artists, taking classes with art majors and advanced students. Create a high quality portfolio that can lead to continued studies in other programs. The minor in two dimensional fine arts is for university students other than majors in the department of art. The minor explores art processes, developing concepts and techniques relevant to the materials, methods, and critically informed aesthetic thinking inherent in making visual art in two dimensions. Two-dimensional concentrations in the department include photography, printmaking, and painting. The minor encourages breadth of exploration balanced with a requirement for a two-course focus in one concentration. A minimum 2.50 GPA is required for admittance to the minor and is required for all courses in the minor. Students planning to take this minor should consult a faculty advisor in photography, printmaking, or painting. The 2D Fine Arts Minor for Art Majors is meant for students in the department of art other than studio art majors. This includes students in Art Education, Art and Architecture History, and Graphic Design. The minor explores art processes, developing concepts and techniques relevant to the materials, methods, and critically informed aesthetic thinking inherent in making visual art in two dimensions. Two-dimensional concentrations in the department include photography, printmaking, and painting. The minor encourages breadth of exploration balanced with a requirement for a two-course focus in one concentration.